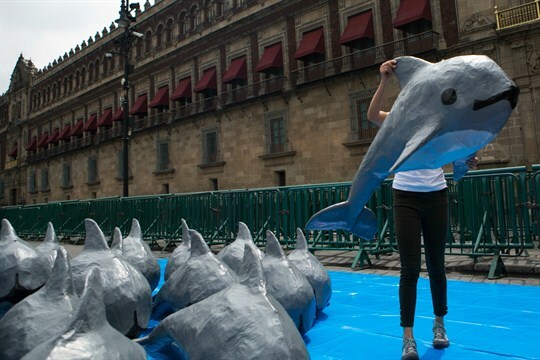 A young woman with the World Wildlife Fund carries a paper mache replica of the critically endangered porpoise known as the vaquita marina, Mexico City, July 8, 2017 (AP photo by Rebecca Blackwell). Mexico has taken extraordinary measures in recent years to protect marine life threatened by illegal fishing in its waters. But fishermen and drug cartels that profit off illegal fishing have pushed back, heightening tensions. In late December, Mexican fishermen in the Gulf of California shot down a drone that the conservation group Sea Shepherd had deployed to monitor illicit activities. In an email interview, Johan Bergenas, senior director for public policy at Vulcan Inc., and David Soud, head of research and analysis at I.R. Consilium, discuss the impact of illegal fishing in Mexico and the government’s efforts to stop it.